Captain Billy's 4WD Hire - I'm ready for the next big adventure back and beyond! Cape York Peninsula is located in North Australia and is situated just north of the tropical resort town of Cairns. Extending over 750km’s along a narrow peninsula to its tip in the North, Cape York covers approximately 207,000 square kilometres and is surrounded by the Coral sea to the east, the Arafura sea and Gulf of Carpentaria to the west, and the Torres Strait to the north. As one of Australia's few remaining large wilderness areas, Cape York Peninsula boasts a plethora of national parks, white sandy beaches, breath-taking rain forests, fabulous fishing and a terrific climate. 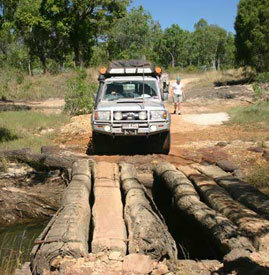 With mainly dirt roads as access, experienced 4WD enthusiasts enjoy the challenge of negotiating the rugged, and at times unforgiving terrain, whilst enjoying the sights of a land steeped in history, ancient culture, billabongs, waterfalls and Aboriginal art. From Cairns the driving distance is approximately 1000km each way and most drivers allow a minimum of 14 days - 7 days each way. Captain Billy's Cape York 4WD Hire is located in Cairns and offer what they consider the most suitable and safest 4WD hire vehicles and Accessories for the extreme off-road conditions you'll encounter during your exciting Cape York self-drive discovery!